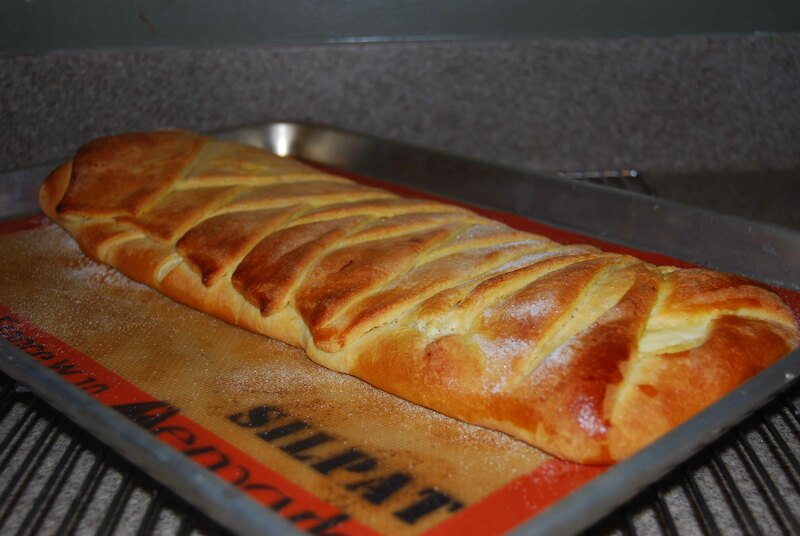 I’m back home after a week long training in Sacramento and I just pulled my Danish Braids out of the oven, whew! I’ll post prettier photos, the recipes and reviews later. For now, here’s what I’ve got sitting on my counter. Be sure to check back later. 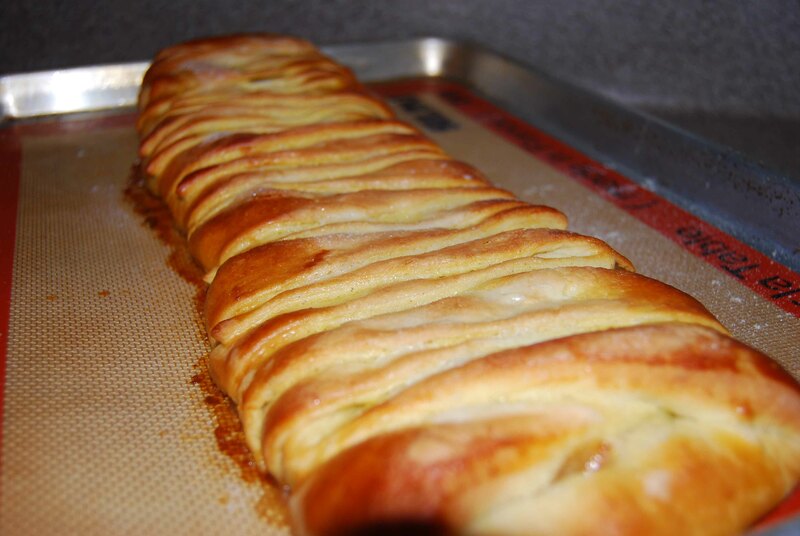 And check out all of the other Daring Baker‘s Danish Braids…yum! Okay, it’s later…first of all, my family loved these! What a way to start a Sunday morning! 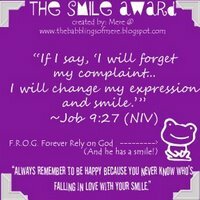 My thanks to Kelly of Sass & Veracity and Ben of What’s Cookin’? for hosting such a fun challenge. After doing this recipe, I learned that you have to allow time for the dough to rise. For me, it was late and I was tired. I gave my dough just one hour to rise. As you can see by my photos I didn’t get the great rise that others did. That being said, when pressed for time, it can work. I will try these again. And am trying a cream cheese with blackberry topping next. Also, next time I will make the dough a day ahead. Then do my fillings, braiding, and final proof on my baking day. It will be much easier and I won’t be rushed for time. 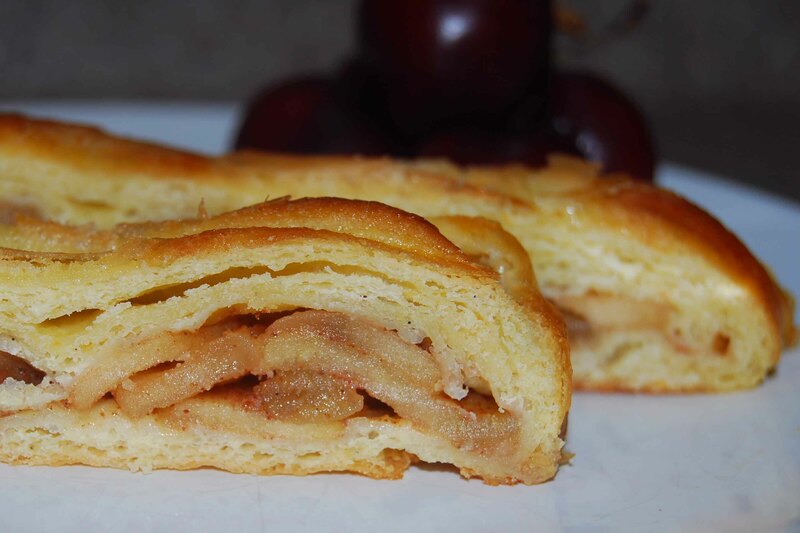 My daughter and I agree that the apple filling braid was the best. The filling was the perfect compliment to the dough. Oh and the dough, the orange and vanilla bean were perfect and made this a tasty treat. I saved my $10 and skipped the cardamon spice…didn’t miss it at all. My hubby and son agreed that the cream cheese with chocolate chip filling was the best braid. 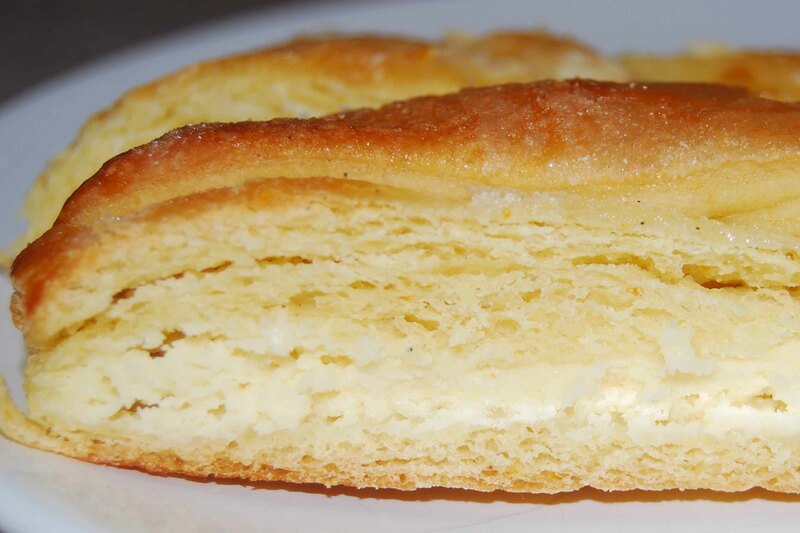 For the cream cheese filling I consulted The Secrets of Baking by Sherry Yard (yes, the book the danish braid recipe hails) and found her recipe for Cream Cheese Filling. Here’s a look at some of those chocolate chips sprinkled on the cream cheese filling, yes I could have used more…live and learn. Cream together until smooth. Spoon onto the danish and bake. 4. Roll out, turn, and refrigerate the dough two more times, for a total of four single turns. Make sure you are keeping track of your turns. Refrigerate the dough after the final turn for at least 5 hours or overnight. (After the final turn I only left it in the refrigerator for 30 minutes) The Danish dough is now ready to be used. If you will not be using the dough within 24 hours, freeze it. 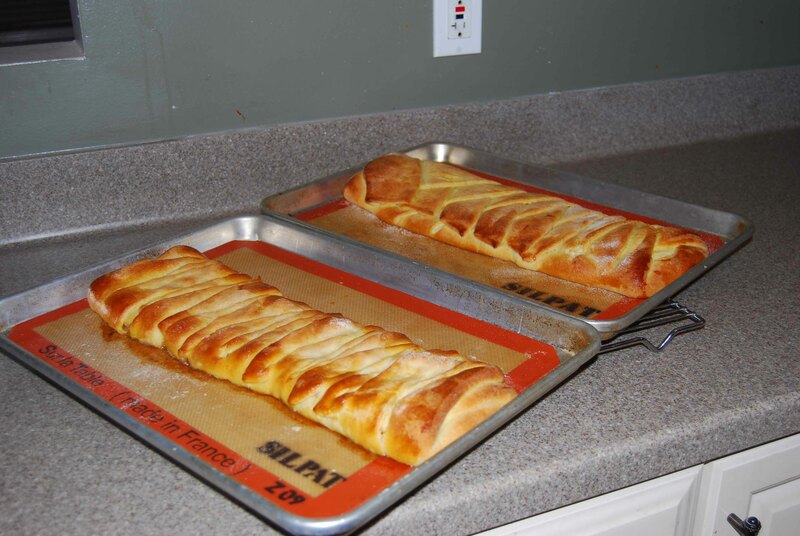 To do this, roll the dough out to about 1 inch in thickness, wrap tightly in plastic wrap, and freeze. Defrost the dough slowly in the refrigerator for easiest handling. Danish dough will keep in the freezer for up to 1 month. mmm creamcheese and chocolate what could be better??? YUM! Hot Fresh danish? I’m on my way over! Oh wow those look great! 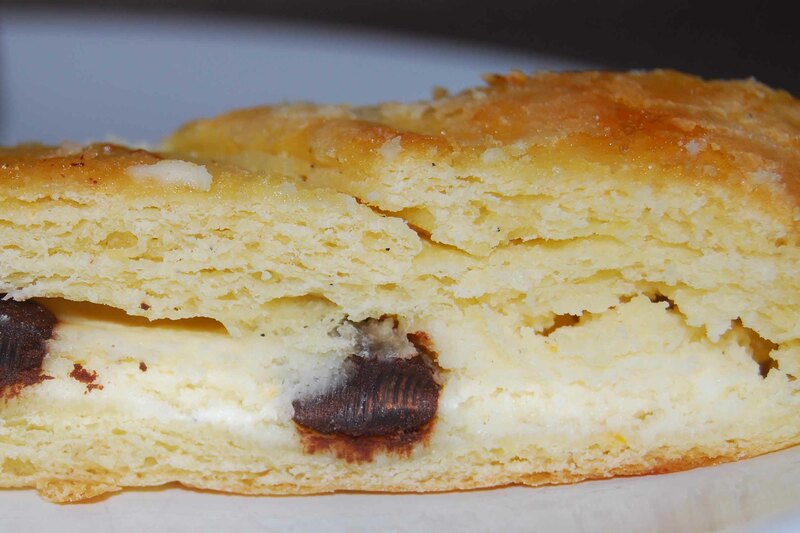 The cream cheese and chocolate chips…What a fabulous idea! Yum! Cream Cheese and Chocolate!!! Cream cheese and chocolate chips?! Cream cheese and chocolate chips?? I love you. Please mail me a piece. Seriously though, that looks and sounds SOO good. Ah, that last comment by “christina” was me. Once again, I forgot to log out of my sisters info. I’m sorry! I don’t know how to delete it! cream cheese and chocolate chips. sounds wonderful. love your filling choices, your braids look delicious! Yay for danish pastry! It looks very yummy. Oooh cream cheese and chocolate chips! Wish I’d thought of that one. Or maybe now, cuz then I would have had to eat it all…Great work! I would have liked them both! Great job, they turned out awesome. Yum – cream cheese and chocolate. Great job on this challenge! Well done on the challenge!! Your fillings looks absolutely delicious – and I love your braids! What a trooper you are adding this challenge into a travel schedule. Nice work. Your braids look very yummy! your family has good taste – each of your braids sounds and looks fabulous! what? they get prettier than that? I want the apple one…yum! I’m glad you’re back too…I kept checking in all week just in case you were bored and decided to whip something clever up in your hotel room, LOL! What a wonderful scene to come home to. 🙂 Great job on this month’s challenge. Ooo cream cheese chocolate filling sounds so good! Your braids look great. That looks so delicious. I like the cream cheese and choc chips idea. Yum! Looks great! I love the cream cheese filling. My second braid is in the oven right now – the wait is killing me – and these pictures aren’t helping! The chocolate chips with cream cheese sound great!